Illinois maps from Omnimap, the leading international map store with over 275,000 map titles. Illinois Atlas and Gazetteer. 1:150,000. DeLorme. Excellent road atlas with topographic maps and gazetteer. Superb for backroads, forest service roads, etc. Illinois Road Map. Rand McNally. Detailed road map of Illinois. The map includes inset maps of maps of: Bloomington/Normal, Champaign/Urbana, Chicago & Vicinity, Downtown Chicago, Decatur, Peoria, Quad Cities, Rockford, St. Louis & Metro East, and Springfield. Map size is 28 x 40 inches unfolded. $5.99 62-6590 1 sheet, folded. Southern Illinois Road Map. GM Johnson. This detailed map features golf courses, campgrounds, airports, colleges and universities, historic sites, parks, recreation areas, points of interest, and much more. The map covers the southern quarter of Illinois, including Carbondale, Marion, etc. $5.95 62-65904 1 sheet, folded. 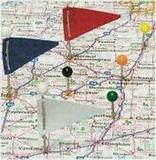 Illinois Easyfinder™ Road Map - Laminated. Rand McNally. The durable and convenient Illinois EasyToFold state map will take all the wear and tear your journey can dish out. The heavy-duty laminated design allows you to mark your route, make notes, then wipe the surface clean for further use. Map size is 18 x 17 inches unfolded, perfect for use in a car. $7.95 62-65901 1 sheet, folded. Illinois Guidemap - Laminated. National Geographic Maps. The front side is an easy-to-read road map with insets of: - Rockford - Champaign / Urbana - Decatur - Peoria - Blommington / Normal - Quad Cities The back includes: - Map and information for Chicago - Points of interest - Map and information for Springfield - Scenic drive - Park Service sites in Illinois. Map size is 17 x 24 inches unfolded. Sample detail of the Illinois road map. Image of the front of the Illinois road map. $7.95 62-65902 1 sheet, folded. Streets of Chicago Map. Rand McNally. Detailed street map of Chicago. Includes coverage of Chicago, Berwyn, Bridgeview, Brookfield, Burbank, Cicero, Elmwood Park, Evergreen Park, Franklin Park, La Grange, Lyons, Oak Lawn, Oak Park, Riverside, and Willow Springs. Map size is 28 x 40 inches unfolded. $6.99 62-6592CH 1 sheet, folded. Highways of Chicago & Vicinity Map. Rand McNally. This map covers the major roads of a wider area around Chicago. Includes coverage of Chicago, Aurora, Crystal Lake, Elgin, Elmhurst, Evanston, Gary, IN; Gurnee, Joliet, Naperville, Schaumburg, Skokie, Waukegan, and Woodstock. Map size is 28 x 40 inches unfolded. $6.99 62-6592CR 1 sheet, folded. Chicagoland: City, Suburbs, & NW Indiana Street Map. Great Pacific Recreation Maps. Comprehensive coverage from the Wisconsin State Line to Northwest Indiana. Includes detailed inset maps of Downtown Chicago,Hyde Park and the U. of Chicago, O'Hare International Airport, Rosemont, and Chicago Transit Authority (CTA) Elevated & Subway Rapid Transit lines. Also includes Metra, South Shore & Amtrak, Parks & Forest Preserves, Hiking & Biking Trails, Spectator Sports Venues, Shopping & Markets, Golf Courses, Museums & Historic Places, and Resorts & Conference Centers. $5.95 62-6592CHK 1 sheet, folded. Chicago & Lake Michigan Street Map. 1:12,000. ITMB. Folded street map of Chicago. Legend shows places to stay and places of interest, train stations, Elevated transit lines, subways, parks, churches, museums, bicycle routes, department stores, Universities/colleges, buildings of architectural importance, and much more. $8.95 62-65921IT 1 sheet, folded. Chicago Metro 14-County Area Street Map. American Map. The Chicago, IL Metro 14-Counties fold map is a full-color, regional map, including the counties of: Boone, Cook, DeKalb, DuPage, Grundy, Kane, Kendall, Lake, McHenry, and Will, in Illinois; and Kenosha, Milwaukee, Racine, and Waukesha, in Wisconsin; and features: detailed street insets of Downtown Chicago and Downtown Milwaukee, Golf Courses, Parks and Rec Areas, Places of Interest, and Universities. $7.99 62-6592CM 1 sheet, folded. Illinois City Maps. Various publishers. $6.95 62-6592BL Bloomington & Normal City Map. (GM Johnson). This covers Bloomington Illinois, not Bloomington, Indiana. $5.99 62-6592CHAM Champaign and Urbana Street Map. (Seeger). $5.99 62-6592CG Champaign/Urbana City Map. (Universal Map). Now out of print - limited stock left. $5.95 62-6592NWC Cook County Northwest street map. (GM Johnson). $5.99 62-6592DE DeKalb street map. (Seeger). $5.95 62-6592ELG Elgin and St. Charles city map. (GM Johnson). 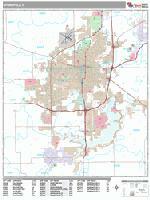 $5.95 62-6592JOL Joliet and Will County city map. (GM Johnson). $5.95 62-6592LCN Lake County North street map. Includes Antioch, Fox Lake, Grayslake, Gurnee and adjoining communities. (GM Johnson). $5.95 62-6592LCS Lake County South street map. Includes Highland Park, Lake Forest, Lake Zurich Libertyville and adjoining communities. (GM Johnson). $5.95 62-6592MCHE McHenry County street map. (GM Johnson). $6.95 62-6592NAP Naperville and Aurora city map. (GM Johnson). $5.95 62-6592NOR North Shore street map. (GM Johnson). $5.99 62-6592NO North Shore street map. (Universal). Now out of print - limited stock left. $5.95 62-6592ORL Orland Park City Map. (GM Johnson). $5.99 62-6592PEO Peoria Street Map. Includes surrounding towns. (Seeger). $5.99 62-6592SPRI (IL) Springfield & Decatur Street Map. (Seeger). Illinois City Maps - Laminated Maps. Laminated Chicago Public Transportation Map - Bus, CTA - Folding pocket & wallet size mini metro map for travel around the city by public transport. $1.95 62-65921CT 1 sheet, folded. University of Chicago & Hyde Park Map - Laminated Map. Hedberg. Amazing detail of UC and the surrounding neighborhoods. Every University and other institutional building and residence, along with shopping, dining and recreational detail. Includes a map connecting Hyde Park to the Loop, and a complete index. $6.95 63-1530 1 sheet, folded. Chicago Destination Map. 1:9,000. National Geographic Maps. In addition to the easy-to-read map on the front, the back includes: - Regional map - Points of interest - Map and information for Lake Shore Drive & Lincoln Park - Chicago Transit Authority map - O'Hare International and Midway International airport diagrams. Map size is 17 x 24 inches unfolded. $7.95 62-6592CN 1 sheet, folded. Downtown Chicago Plus Map. Great Pacific Recreation Maps. Downtown & Edgewater to Hyde Park in exceptional detail. Large Scale, Color-Coded. Lakeside neighborhoods from Edgewater in the north through Downtown to Hyde Park on the south. Downtown Buildings. All Streets & Freeway Ramps. CTA Rail & Bus Lines. Metro area map with points of interest, freeways & METRA commuter rail. $6.95 62-6592CHA 1 sheet, folded. Chicago Red Map. Red Map. The essential guide to the best of Chicago. Highlighting Lincoln Park, Old town, the Gold Coast, the Loop, River North and Prairie Aveune Historic District. Serves as the ultimate guide to the cultural institutions, museums, architecture, parks and landmarks of Chicago, along with an easy to use metro 'L' map, and of course the best of shopping. Map size 24 x 9 inches unfolded. $9.95 62-65921RC 1 sheet, folded. Our soft-laminated folded map of Chicago shows Chicago Downtown 1:8,000, Lincoln Park 1:16,000, Hyde Park 1:20,000, Chicago & Region 1:250,000, O'Hare Airport 1: 22 500, Public Transportation CTA, Top 30 Sights and USA administrative & time zones. Borch Maps are easy to fold, durable and water-repellent with a wipeable surface. Borch Maps show hotels, museums, monuments, markets, public transport, top sights and points of interest, useful statistics, conversion charts for temperatures, weights and measurements, climate charts showing temperatures, sunshine hours, precipitation and humidity, overview maps, time zones, and much more. $8.95 62-6592CJ 1 sheet, folded. The Chicago Guidemap includes detailed sections for "The Magnificent Mile", the Shoreline of Chicago, Out-of-Town, and the transit system (CTA). $7.95 62-6592CE 1 sheet, folded. This is a waterproof mini version of our MapEasy Chicago guidemap listed above. $6.95 62-6592CHI 1 sheet, folded. Rockford Laminated Street Map. American Map. This all-in-one, laminated City Slicker Map of Rockford, Illinois includes Cherry Valley, Loves Park, Machesney Park and Rockford. This easy-to-read, four-color map also includes a convenient index that makes navigation quick and simple. Now out of print - limited stock left. $8.99 62-65921RO 1 sheet, folded. We offer wall maps for Arlington Heights, Aurora, Berwyn, Bloomington, Bolingbrook, Champaign, Chicago, Cicero, Coles, Decatur, Des Plaines, Elgin, Evanston, Hoffman Estates, Joliet, Mount Prospect, Naperville, Normal, Oak Lawn, Oak Park, Orland Park, Palatine, Peoria, Rockford, Schaumburg, Skokie, Springfield, Tinley Park, Waukegan, Wheaton. Click here to see sample images, prices, sizes, and mounting options. Three popular long-distance trails traverse parts of Illinois. These include the Great Rivers South Trail, the Northern Tier Transcontinental Trail, and the TransAmerican Trail. Click here for our Illinois cycling maps list. Illinois Fishing Maps. We stock numerous fishing maps for Illinois lakes, rivers, and reservoirs. Click here for our Illinois fishing maps. We stock all USGS topographic maps of Illinois at all available scales. US Forest Service Maps for Illinois. We stock the USFS map for the one National Forest section in Illinois. Click here for our Illinois Forest Service maps. Illinois State and County Wall Maps. Intelligent Direct. Illinois Wall Map. Kappa Map Group. The Kappa map has more detail than the Intelligent Direct maps above, but are more congested. Please see the example below. Size is 50 x 67". Available laminated or laminated with plastic rails top and bottom. Illinois Shaded Relief Wall Map. 1:500,000. Raven Maps. Our Illinois map beautifully displays the delicate landscape. From Lake Michigan to the Ohio and Mississippi Rivers, the valleys, plains, rivers, and prairies are exquisitley mapped in shades of greens and light browns. Elevations are represented by color, and this, in combination with our relief shading technique, gives the map a 3-dimensional look. Size is 33 x 55". Illinois Quaternary Deposits Map. 1:500,000. 1979. Illinois State Geological Survey. $3.95 62-1000IL Illinois flag, small. Size 4 x 6 in. $9.95 62-1001IL Illinois flag, medium. Size 8 x 12 in. $39.95 62-1003IL Illinois flag, large. Size 2 x 3 ft.